I know that many believe Halloween to be a time meant for thrills and chills, but I would argue it’s also the best time to celebrate the strange and downright weird. You don’t need a massive body count or a crazed killer to have a good time with the world of horror, you just need an original idea, and as far I know there is only one film about a mysterious alcohol that causes people to melt: J. Michael Muro’s Street Trash. Released in 1987, which just so happens to be the year this writer was born, Street Trash follows the life of a homeless community that inhabits a rundown city salvage yard. The various people who make up this community spend their days drinking and searching for food, while at night they toast the stars and cause all sorts of trouble. Some have fallen on hard times, but others are essentially criminals on the run. To be perfectly honest however, each character’s grasp on the duality of good and bad means very little after one member discovers a mysterious new beverage. Purchased from a liquor store owner who chose to make a quick buck instead of disposing of the product as he was asked to do, Viper is a cheap liquor that goes down smooth and later comes out of every orifice in your body. It might create some new ones as well. You see, for reasons unknown the contents of viper cause the people in Street Trash to transform from humans into what I can best describe as globs of brightly colored paint. Yes, paint. It looks just as silly as it sounds, but it’s entertaining nonetheless. I no longer remember who first told me about Street Trash, but I can recall the amusement and immediate connection I felt to the film as if I first encountered it just last night. I’ve written about this at length in other articles, but in my opinion there is no feeling on Earth that can compare to the rush of dizzying delight that comes with viewing art that is not afraid to be unique. Whether their ideas be funny, sick, endearing, or depraved, filmmakers who dare to think outside the confines of classic movie making in order to present truly unique visions risk everything to entertain and that, in my opinion, is incredibly noble. That may sound like an incredibly dramatic way to describe the actions of a person who brought melting hobos to movie theaters, I know, but it’s true. Muro and his team had to know people were going to laugh at their idea, but they forged ahead and made it a reality. They stared into the eyes of a world that loves to reject originality and chose to stand their ground. Whether or not the results were financially successful matters very little because regardless of ticket sales the fact remains that this film was brought to life. It exists, and as long as we have home video or streaming it will be available to entertain and inspire those with a taste for the unique. This Halloween, take a break from the typical horror fare and try your luck with a film that is far funnier than it is terrifying. 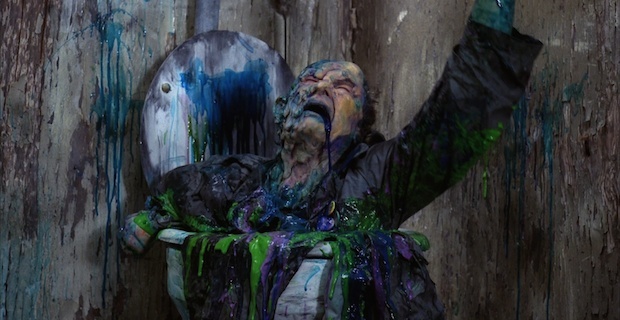 There is nothing in Street Trash that will give you nightmares, but the ludicrous originality on display will most certainly leave you and anyone watching with you in stitches. I know we talk a lot about movies that are unlike anything else, but that statement may never have been as true as it is in this case. Street Trash is the kind of film you never forget (even if you want to).